Sunsets No Skyscrapers members Janet Pettigrew, Mike Needham, Marilyn Needham, Fran Maloney, Della Cameron, Jason Thwaites and John Kirkman oppose 3 Oceans’ revised plans for proposed Iconic Scarborough development. A GROUP of Scarborough residents are banding together to fight plans for the proposed Iconic Scarborough development. The newly formed Sunsets Not Skyscrapers campaign follows Chinese developer 3 Oceans’ release of revised plans for $450 million twin towers at the former Contacio site on Scarborough Beach Road. The Metropolitan Redevelopment Authority is seeking public comment on the plans for the residential and hotel complex, after rejecting the original proposal in December. Changes include more slender towers at heights of 43 and 38 storeys, up from 43 and 35 storeys, and a greater focus on tourism benefits including creating a WA Coastal Experience Centre and market hall showcasing WA produce. Sunsets Not Skyscrapers spokeswoman Janet Pettigrew said it contravened guidelines prescribed in the Scarborough Master Plan’s planning framework that allows for a maximum of 12 storeys with discretion to approve an additional six storeys. “If approved, these buildings would be nearly two and half times the height of the Rendezvous Hotel and four times the height allowed under the existing Scarborough planning framework,” she said. “They would absolutely dominate the landscape and surrounding buildings. But according to a statement by 3 Oceans, the authority’s view that the original plan represented overdevelopment of the site related to the scale and configuration of the podium and base of the towers rather than building height. “These elements are substantially reduced in size and impact and the public uses within the base of the building have been reconfigured,” the statement said.“The appearance of more slender towers sitting atop of, rather than blending-in with, the significantly scaled back podium is proposed which also offers improved view corridors. 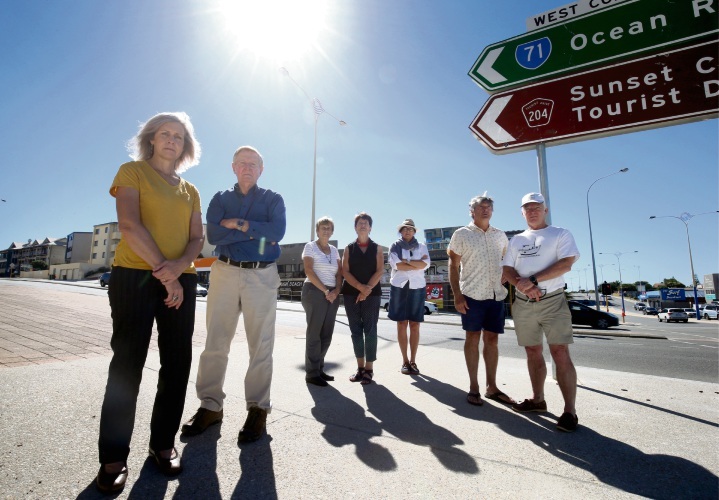 The opposition group is also concerned about traffic impacts, the inconsistency with surrounding area and impact on the beach’s amenity and environment, and believed the three-week consultation period was too short. They held an information session at Scarborough Beach on March 28, which about 50 people attended. Ms Pettigrew urged community members to provide feedback on the proposal as she was concerned the developer was “re-envisioning what Scarborough should look like”. “We have a framework that’s been established through the Scarborough master plan guidelines,” she said. Public submissions can be made at bit.ly/2Gn3Qgv until April 15.